We have been pursuing the concept of a cable car system (Red) to link Cefn Mawr Village Centre via the Crane to WBG, Windborne Gateway Parking (yellow) and backed up by Zip Wires (Green). Installation of such a system with the correct road signage and traffic management can increase the visitor count from 330,000 a year at the aqueduct to 500,000. The Cable Car and Zip Wires acting as a Tourist Attraction and Urban Transport system would provide significant foot fall into our village centre where it will be necessary to reopen the Ebenezer as an Arts & Visitor Centre for the Cefn & Cefn Mawr, as you may have seen in the papers. We cannot tempt tourists onto the Cable Car with the offer of a couple of pints in the Holly Bush Inn! Yes, we have a vested Interest in making this happen. Our pub will only do as well as the community that surrounds it, so the more we can do for our community, the better it will be for our pub. We estimate 30 jobs split between the WBG, Cable Car & Zip Wires and the Ebenezer as an Arts and Visitor Centre for the Cefn & Cefn Mawr at the centre of the Pontcysyllte World Heritage Site (WHS) corridor. If WCBC & partners will work with us for the inclusion of our community in the WHS to bring tourism on a commercially viable basis to our village centre this will take approximately 2 years to complete. This will give all our local shop keepers time to prepare for a large influx of people which will stimulate growth and economic regeneration, which has currently stalled. With increased business activity in our village centre this will no doubt raise the employment opportunity available in the retail sector, hence more jobs again. The significant finance for this project will be found through a combination of private investment, bank loans and whatever grant funding we can secure. However, to make all this happen we need WCBC, CRT & partners to work with us for the Economic Regeneration of our community through Sustainable Tourism Development. So, let’s hope they do. We can have a better future if we want it and try for it. The PKC Group intend to build the Cable Car System originally spoke of six years ago in 2012. We are seeking a loan for this from the Business Development Banc of Wales and have put together a supporting Business Plan. To be successful in securing the required loan it will be necessary for all parties to work with us. The main ones being WCBC, CRT and Eastman Chemicals. The Ebenezer failed for two main reasons, a lack of foot fall and no parking. By linking the WBG to the Ebenezer with the CC system, the problems are solved. There are 330,000 people visiting the aqueduct annually and if only 10% ride the cable car, this still delivers 33,000 tourists onto our streets, enough to keep the Ebenezer busy. Our main problem will be getting WCBC & partners to work with us, but we hope they will come around since this will be the key, they seek and a major boost to the economic future of our community. We estimate with the addition of the CC & Zip Wires the visitor count will rise to around 400,000 annually and our mean estimate of operation is 20% which will provide the operating costs for the Ebenezer. This means that we will be able to offer the display space to our community. We also intend to run training programs as we originally said in 2012 to work with our young people. This will enable them to work with us and look for work outside our community both on and offshore which we will encourage them to do. To help us do this we will be looking at establishing links with other bodies such as the Princes Trust. We intend to pursue this on behalf of our community and can be successful if the relevant bodies will work with us. If you like this idea you can help, like us on Facebook, it will show WCBC and all that we want this. On the 18th of April 2018 another meeting was held at the Holly Bush Inn for the consultants Arcadis to meet the PKC Group and people from our community. Once again the primary objective from the PKC Group was to try and ensure that our community was being included in ways that would actually work in the thrid round of master planning for WCBC, CRT and Eastmans that Arcadis was working on. The PKC Group has attended all meetings and consultations held in 2018 for this new round of master planning by Arcadis to try and ensure our community is not left out and ignored again. At these meetings we have been reassured that this will not be the case and we remain hopeful that this comes true so that our community can be turned around and put on the road to economic recovery which is perfectly feasible given our location and the potential we are surrounded with. For an outline of how our community at the centre of the Pontcysyllte World Heritage Site can be included and our economy regenerated please see the below documents that are all based on Welsh Planning Policy and the Future Generations Act. The Kick Off Meeting 12th January 2017, present members were our local people in the PKC Group, Local Community Council, Local Traders and AVOW. The meeting was about WCBC, CRT & Eastmans who are employing Arcadis Consultants from Cardiff to prepare a third master plan for them. The objective of the meeting at the Holly Bush was to discuss how we could best get our community included in their plans as it had been clearly left out of the two previous master plans by them. With our community immediately next to the Pontcysyllte Aqueduct and at the centre of the World Heritage Site, there is no good reason why it should rate and remain as one of the highest unemployment areas in NE Wales, unless of course it is left out and ignored again. A show of hands in the Holly Bush Inn for getting Cefn Mawr back on its feet, 14th January 2017, please note we all want the same thing, we want our village back and we want WCBC and other third parties to work with us. We do not want to be segregated from the WHS corridor any longer. If there is any doubt about our community being segregated please see “Where is Cefn Mawr” which clearly shows how our community has been left out and ignored. This must stop and WCBC needs to start working in accordance with WPP. The PKC Group organised a Public Consultation for the planned Local Development Plan 2, (LDP2) by Wrexham County Borough Council (WCBC) at the Holy Bush Inn in March 2016. 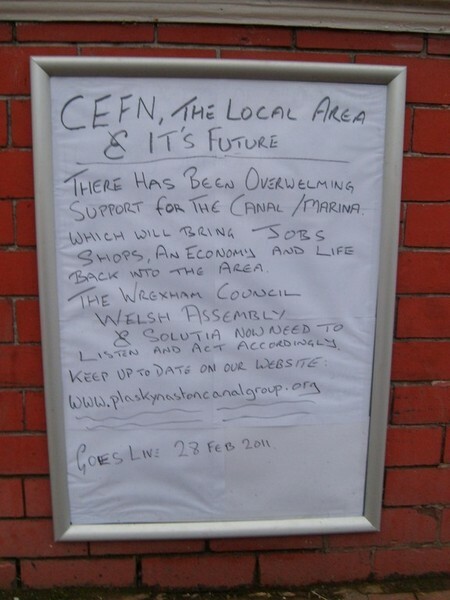 WCBC had not organised one for the local community and so the group helped out and it allowed the group to explain both the LDP2 as being proposed for the Cefn by WCBC and their proposals for incorporation into the LDP2 for the community of Cefn. The PKC Group had held a number of meetings in 2014 and 2015 leading to the proposals submitted to the WCBC for inclusion into the LDP2 during its term until 2028. This website is for Cefn, covering Cefn Mawr and Surrounding Villages that are central to the Pontcysyllte Aqueduct World Heritage Site along the Llangollen Canal. The villages of Cefn and Cefn Mawr are immediately adjacent to both the Pontcysyllte Aqueduct and Cefn Viaduct that span the River Dee Valley. Please send us your input, so we can build a better site and future for us, our children and grandchildren. Have a look and find out about the History, Present, and Plans for the future. Everybody is welcome to the information here on what has happened, is going on or is going to happen and to help out if you want to! The Plas Kynaston Canal once served the industries of Cefn Mawr that provided employment for local people, but eventually became buried beneath the mighty Monsanto Works in the 1900’s. However those works have now closed and the site is vacant providing the opportunity to reinstate the Plas Kynaston Canal back to Cefn Mawr. This would reconnect Cefn Mawr & Surrounding Villages to the Inland Waterway Network. The Llangollen Canal is the UK’s busiest canal and the Pontcysyllte Aqueduct draws over 300,000 tourists annually. The canal could again bring employment opportunities & prosperity to the area by encouraging tourism into our villages and community, exploring the local industrial heritage of our area. Plas Kynaston Hall is a Grade II listed building located within the Cefn Mawr conservation area and has been renovated by the Welsh Georgian Trust. Since the Plas Kynaston Canal, PKC Group was formed in 2010 to promote tourism in the central section of the World Heritage Site on the Llangollen Canal adjacent to the Pontcysyllte Aqueduct the PKC Group has received wide and popular support from the general public both locally, nationally and internationally. The PKC Group are putting the villages that lie between the Pontcysyllte Aqueduct and the Cefn Viaduct along the River Dee and Llangollen Canal on the tourist map. The PKC Group at the Glydrw University in Wrexham to highlight the potential for reinstating the Plas Kynaston Canal back into Cefn Mawr. The group likes to join in with local events around our community to encourage positive outcomes for Cefn. Although PKC Group is based in Cefn Mawr, it also looks at the wider community such as surrounding Villages of the Cefn, the Pontcysyllte WHS and County of Wrexham. Please check out this website for proof. Mark Isherwood AM, Shadow Minister for Communities and Housing visiting Cefn Mawr and the PKC Group. Mark has met a number of high street traders during his visits to Cefn Mawr in support of the group’s activities. The PKC Group continues to be active in the role of seeking the reinstatement of the Plas Kynaston Canal to link Cefn Mawr and the Cefn into the inland waterway network at the centre of the Pontcysyllte World Heritage Site. This news article from 2010 shows a petition of 2000 signatories being handed into the Wrexham County Borough Council. 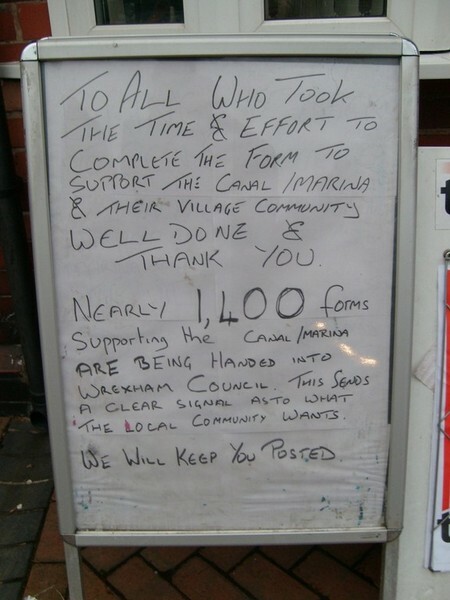 The petition was raised locally in in the Cefn and remains valid. As does all the other work we have done (all of us) since then and we (PKC Group) keep in regular contact with Eastman’s, now the current site owner of the former Monsanto Chemical Works site. Llyr Gruffydd, Plaid Cymru Assembly Member for the North Wales Region discussing matters with David Taylor and Steven Hughes about bringing tourism to Cefn Mawr and the PKC Group proposals to bridge the gap between the Pontcysyllte Aqueduct WHS and Cefn Mawr for the betterment of all. Llyr Gruffydd, visited the site in February 2012 for a meeting with the Heritage Minister of the Welsh Assembly Government. Please note that these forms were in response to the second round of the WCBC Local Development Plan (LDP) Consultation in 2011.They were additional to the 2000 strong petition handed to the WCBC in 2010 by the PKC Group, which had been presented on behalf of our community at the centre of the Pontcysyllte World Heritage Site. The PKC received more support in the LDP than any other nomination for incorporation into the WCBC Local Development Plan. The PKC Group thanks every one for their support and backing on this. Please remember this is a long term project with significant technical difficulties to overcome in order to achieve the full restoration of the PKC. Want to see progress, come for a beer in the Holly Bush Inn or check out the Holly Bush Inn Renovation Story, restored in partnership with the THI & WCBC. We are also proud to work alongside other voluntary groups such as the St Christophers School party clearing Crane Lane in the Cefn and all other local groups we promote on this website. On our website we link these to the national relevant bodies for the preservation and promotion of our local heritage, such as CADW, IWA, National Library of Wales, CRT, National Archives and Visit Wales. The end goal of the PKC Group is to reunite Cefn Mawr with the in land waterway network by reinstating the Plas Kynaston canal between the village and the aqueduct. If you want a copy of this home page please just down load this PDF which will print out easily on any home printer, and all the best from the PKC Group.